Aircraft passengers have time to think about a lot of things when they’re cruising more than seven miles above the earth at 560mph. Work. Family. Whether Switzerland will ever win the World Cup. But of all the things passengers think about, aircraft cabin lighting doesn’t rank very high on the list. Probably somewhere below a postscript to a fuzzy memory of a forgotten afterthought. And that’s fine. That’s the way it should be. It’s the responsibility of aircraft manufacturers, airlines and suppliers to think about aircraft lighting. But not just to think about it: to obsess over it. Because it’s really important. Lighting affects mood. And if you ever want hundreds of strangers to be happy, considerate and relaxed, it’s when they are seated side by side for up to 17 consecutive hours. A new generation of digitally-enabled aircraft is going to help. On the horizon are more comfortable seats, tip-to-tail connectivity that delivers terrestrial-quality wi-fi, and galleys that enable more efficient passenger food and beverage service. Not to be overlooked is cabin lighting. High-tech aircraft cabin lighting will increasingly affect passenger mood by … well, the idea is to help passengers relax, take the edge off, and enjoy the flight. Huh? Lighting can do this? It can certainly help. Here’s a closer look at the science behind lighting at 38,000ft. According to the Mayo Clinic, light is thought to affect brain chemicals linked to mood and is sometimes used to help treat the symptoms of seasonal affective disorder (SAD) and depression. Other research has found that specific lighting hues help relieve stress, reduce fatigue and adjust a body’s circadian rhythm so that jet lag is less pronounced. Sight – A wider range of lighting colors and intensities enables more enjoyable reading, movement and relaxation. Aircraft cabin lighting can now imperceptibly transition passengers from early morning coffee to mid-afternoon snacks, through early evening dinner into late-night movies. And imagine waking up to a gradient of slowly-illuminating warm colors instead of a blast of fluorescent white light. Lighting shades, tints and tones make all the difference, and it’s coming to an aircraft near you. Smell – Research has shown a significant correlation between sight and smell; lighting impacts our ability to detect aromas. In fact, studies have shown that the brain’s visual center lights up with activity when someone attempts to distinguish between multiple aromas. Hearing – Communication is much easier when facial cues are sharpened by perfect lighting. That’s why people hear better when they clearly see the person they’re talking with. Taste – Like the sense of smell, our ability to perceive and appreciate various flavors is heightened by environmental lighting. When the color and presentation of food is sharpened, we anticipate the expected flavor and food just tastes better. Touch – Depending on lighting hue and intensity, the same touch can be comforting or annoying. Ask a parent trying to calm a small child if this is important. 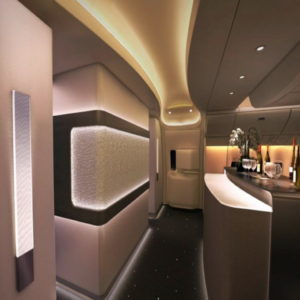 Despite the significance of commercial aircraft cabin lighting in setting a mood and encouraging relaxation, the purpose of lighting isn’t only to impact the senses. 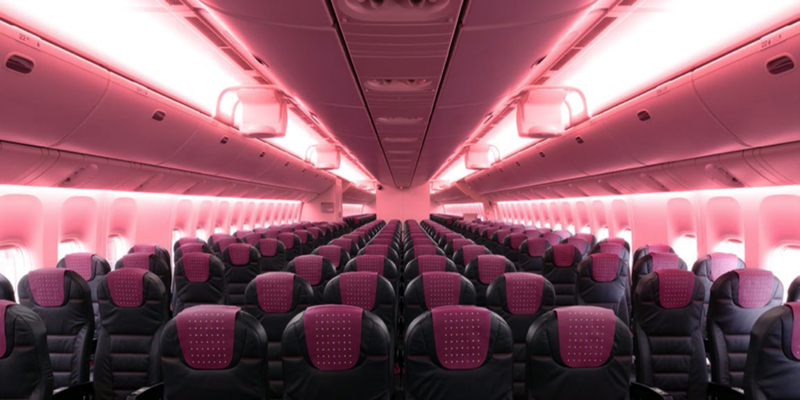 Specialty lighting is uniquely designed for galleys, lavatories, individual seats, overhead bins, and emergency escape-pathing. This lighting makes the movement of passengers safer and more efficient when boarding, placing carry-on baggage in overhead bins, handling food and beverage service, and deplaning. The last stop on a tour of lighting science is robust product testing and quality control. And here we consider the fun and fatal folly of static electricity. Popping my younger sisters with static electricity from the family living room carpet was fun. If I’m honest, a lot of fun. Yet even that small amount of static electricity can destroy delicate lighting components. That’s why during the construction process, technicians wear special anti-static lab coats and wrist-wraps that harmlessly discharge electrical-charge buildup. Aircraft lighting components are then scanned, calibrated, vibrated and heated/cooled in thermal test chambers to ensure they can withstand the rigors of flight at more than 38,000ft and at Mach .83. As significant as aircraft lighting is, its impact on the passenger experience is often underappreciated. That’s about to change. Now more than ever, OEMs, airlines and suppliers understand that if they make cabin lighting a “wow” experience, they will be rewarded with growing passenger loyalty, not only to their brands but to families of aircraft. That’s great news. Now if Switzerland could just win the World Cup.